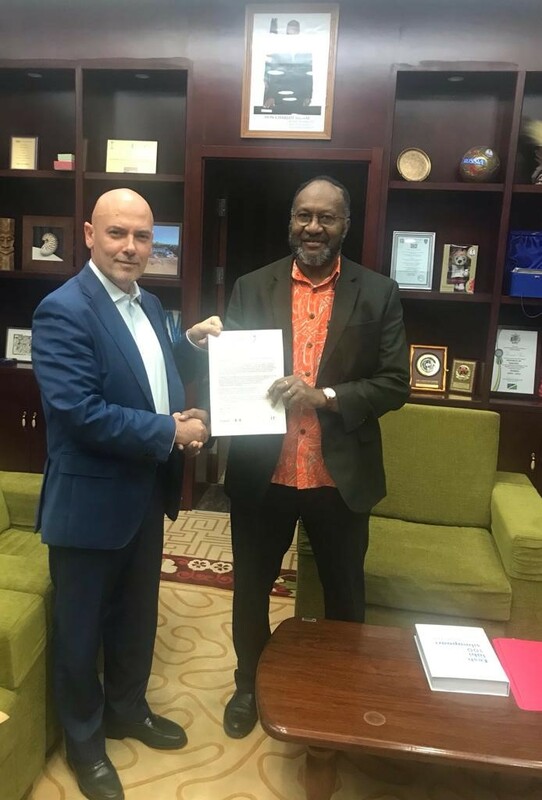 The Right Honorable Charlot Salwai Tabimasmas – Prime Minister of the Republic of Vanuatu has received a formal invitation to attend the Halifax International Security Forum to be held in Halifax, Canada on 16th – 18th November. The invitation from the President of the Halifax International Security Forum was personally handed by His Excellency Azzam Makhlouf – Vanuatu’s Honorary Consul to Lebanon and Special Envoy to the Middle East, to the Prime Minister on Thursday 25th October 2018. The meeting is attended by many of the world’s prominent leaders and notable individuals in global politics and business and attendance is by invitation only. Halifax International Security Forum is dedicated to strengthening strategic cooperation among democracies and is recognized as the leading gathering of democratic leaders committed to global security and prosperity. Setting the security agenda each November for the coming calendar year, the Forum convenes relevant and key leaders in an unscripted, intimate atmosphere over three days in Halifax, Nova Scotia. The Forum brings together individuals on the ground who face consequential local threats, writers who challenge and influence the world’s thinking on security, and decision-makers who make the tough choices. The community that meets at Halifax represents more than 90 countries, yet is limited to 300 participants. Halifax International Security Forum is widely acknowledged by the international community as an essential annual meeting place. Halifax International Security Forum is an independent, non-profit, non-partisan organization based in Washington, DC. Defining security broadly, Halifax International Security Forum engages an approach that addresses today’s range of threats, from war, terrorism, cyber-attacks, and nuclear proliferation to climate change, resource security, pandemics, and economic stability. Halifax maintains that true security is only achieved when people enjoy the benefits of democracy, leading in turn to economic opportunity, and lasting peace. With the generous support of the Canadian government, Halifax International Security Forum was founded in 2009 as a program within the German Marshall Fund of the United States. In 2011, Halifax International Security Forum became an independent, non-profit organization and welcomed Foreign Affairs as its official media partner. The formation of the Halifax Canada Club in 2012 marked the beginning of a public-private partnership to provide long-term support for the work of Halifax International Security Forum. Today, the Forum continues to advance greater strategic cooperation among the world’s democracies in order to address the most pressing international security challenges. This initiative is part of an effort that was facilitated privately as part of an intention to facilitate and improve the Republic of Vanuatu’s broader international outlook and access to international global decision making on issues that affect the world globally. This is the first time that a Vanuatu’s Prime Minister has received an invitation to attend this forum which is considered a significant achievement and opportunity for the Prime Minister and the Republic of Vanuatu as a nation. Prime Minister Salwai Tabimasmas’s invitation has been facilitated by His Excellency Azzam Makhlouf with a view to broadening Vanuatu’s international global relations and enabling the Prime Minister of the Republic of Vanuatu to attend, have access to and meet with global business and political leaders from over 90 countries in a semi-formal and personal atmosphere. During the Honorary Consul Makhlouf’s recent visit, he also met with Honorable Jotham Napat – Minister of Infrastructure and Public Utilities to deliver an invitation to Minister Napat to visit the Middle East with a view to securing funding and assistance that will help facilitate development initiatives to complement current developments in the Nation’s infrastructure sector. 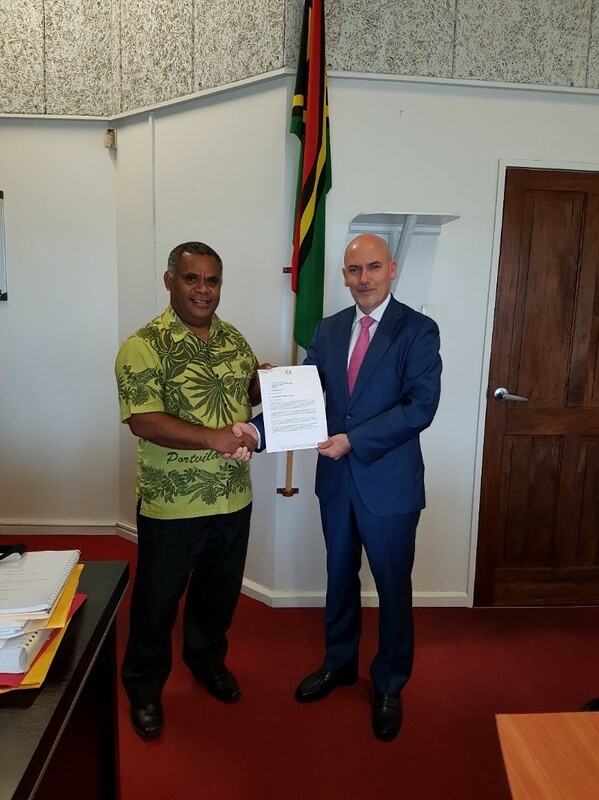 Honorable Napat’s assistance has been invaluable in facilitating Honorary Consul Makhlouf’s efforts to promote Vanuatu internationally and facilitate opportunities for assistance and investment for the Republic of Vanuatu.